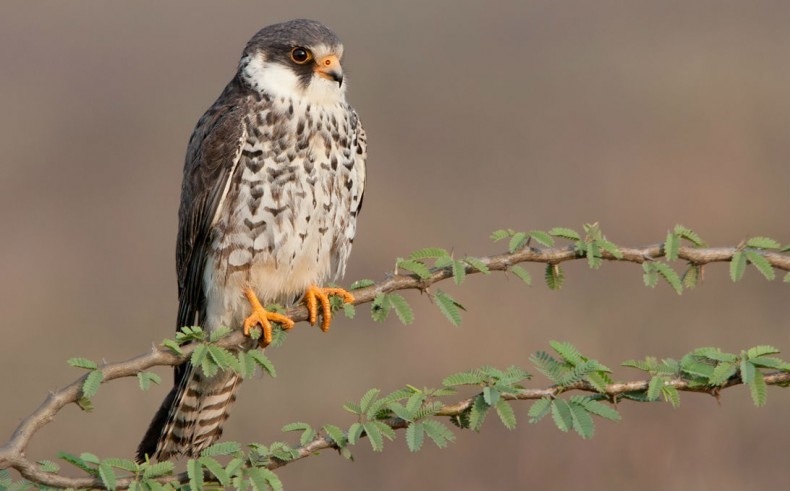 Nagaland : Migratory birds created awareness among the residents of Pangti village, who had vowed to protect, shelter and care for the longest travelling birds Amur Falcons, in the region of Doyang Lake in Nagaland. Their efforts found anchor from Ministry of Environment, Forest and climate change as the ministry took interest in protection of these migratory species. The move came in when Union Environment Minister Prakash Javedkar decided to personally visit the Doyang Lake in Nagaland and take note of facilities which are existing in the region. The Falcons follow the aerial route of Magnolia to South Africa, en route India. It is during their perch in Indian territory that they descend upon the Nagaland region of Doyang Lake, as the species have chosen to spend the season of migratory halt in this environment of water body in Doyang Lake. Millions of Amur Falcons come to Doyang lake every year to rest, making the place a delight to watch. Three Amur Falcons were tagged with satellite device back in 2013 by researchers to observe migratory behaviour of the birds. Tracking of these birds was in progress since then, which resulted in a recent spotting of two of them back in the region. Of the three tagged ones, two birds named Naga and Pangti have returned home twice since then. Both the birds started their journey from Mongolia and flew non-stop for five days, covering a distance of 5,600 km to reach Doyang lake in Nagaland. Soon after getting the news of two tagged Amur Falcons returning to Nagaland, Union Environment minister Prakash Javedkar visited the site. He visited the lake and was welcomed by millions of birds swarming over Doyang Lake in Nagaland. He took a round up of existing provisions for the upkeep and preservation of these transient avian species and vowed to supply funds for developing the lake as an eco-tourism spot. He also announced that central government would fund and support the state government in converting the lake into an eco-tourism spot which would serve as a paradise to bird-watchers. Minister acknowledged the achievement of village on their initiatives in preserving the migratory species, conserving extremely endangered species and actively supporting migratory return by these rare birds, and said, Pangti village gained worldwide recognition as the home of world’s longest distance travelling birds where one could see more than millions of birds within 30 seconds. Javedkar announced that four to five birds would be tracked annually and they would be also named after the village they relate, keeping in line with the earlier practice of naming the birds upon the village where they get located, like — both the birds Naga and Pangti were named after the village to which they belong.